Culms: Erect, slender, unbranched, round in cross-section, without nodes. Leaves: Alternate, erect, long-linear, much longer than inflorescence, 1/5 to 1/2 inch wide, bluish-green to dark green, glabrous, convex on back. Sheaths: Closed, with auricles at summit. 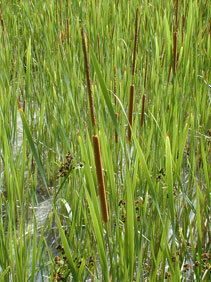 Inflorescences: Spike, cylindrical, erect, slender, terminal, monoecious; staminate portion above, separated from pistillate portion by 1/2 to 3 inches of naked stalk; pistillate portion 3 to 8 inches long, 2/5 to 4/5 inch thick, dark brown. Flowers: Numerous, minute, packed densely together; perianth lacking; staminate bracts linear; pistillate flowers subtended by slender bracts darker brown than stigmas; stigmas linear, dark brown. Fruits: Achene, spindle-shaped, numerous downy hairs at base, enclosing nut-like seeds. Habitat: Marshes, wetlands, pond edges, ditches, and along streams; tolerates deeper water than broad-leaf cat-tail and is more salt tolerant. Uses: Native Americans mixed the pollen of the staminate spikes with ground wheat and ate as food. The leaves were used as roofing material and the silky down for pillow stuffing. Pioneers boiled and ate the young pistillate inflorescences. Comments: Cat-tails provide wildlife cover. See also broad-leaf cat-tail Typha latifolia.